Rising affordability issues for would-be buyers impacts renters as well. Home prices have been consistently rising with Q1 2017 home prices surging 6.9 percent quarter-over-quarter and 5.9 percent year-over-year. Some aspiring buyers look to renting in the ‘burbs as a cheaper option, but Zillow’s latest rental study shows that rents in suburban and urban areas are facing affordability issues of their own. 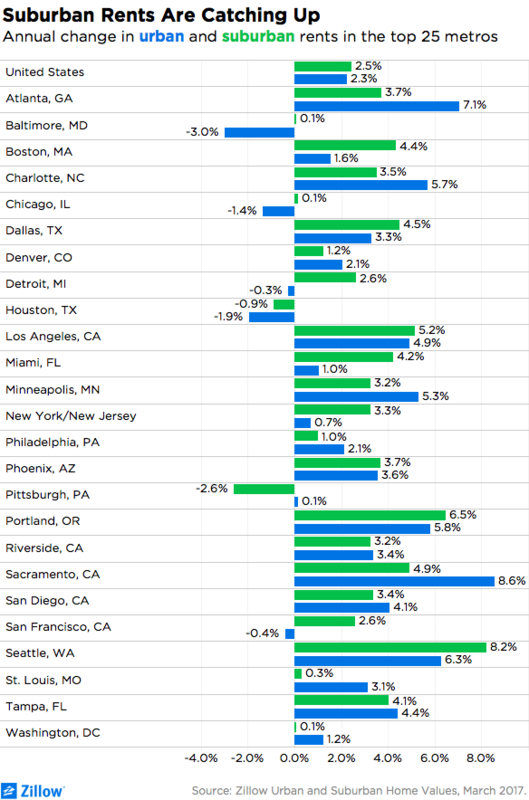 The median monthly cost of a suburban rental is up 2.5 percent year-over-year, which is 0.2 percentage points above year-over-year urban rental cost growth — something that hasn’t happened in four years. Zillow says the trend is more pronounced in booming housing markets such as Nashville, Tennessee; San Francisco; and Seattle; where residents are moving to the outskirts of the city to escape high urban rents. For example, over the past decade, the share of income needed for the median rent payment in the San Francisco metro has increased from 34 percent to 44 percent. In the same time period, the share has increased from 26 percent to 32 percent in the Seattle metro. 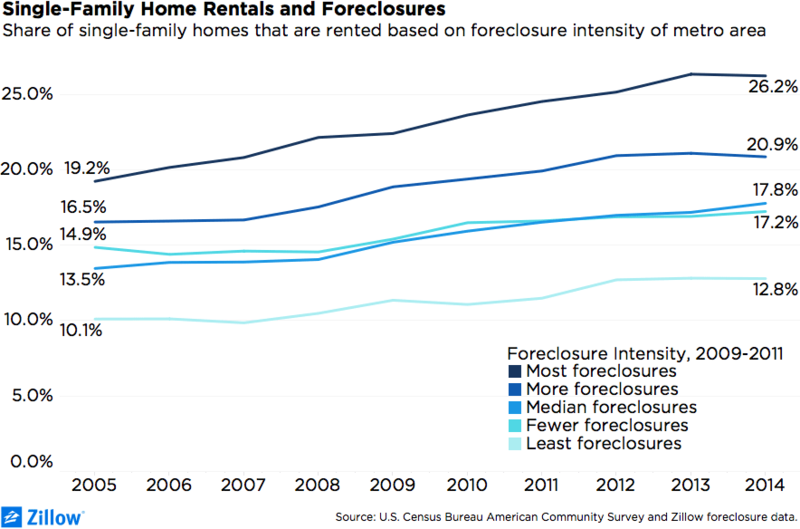 The study revealed that the foreclosure crisis pushed homeowners to rent the same kind of single-family homes they once owned in suburban areas. From 2005 until now, the percentage of single-family rentals rose from 12.7 percent to 19.2 percent. Monthly rent is generally less expensive in suburban communities (even as rents there grow more quickly), which means suburbs are currently an increasingly attractive option for budget-conscious renters. Suburbs also have a higher concentration of single-family homes, which are increasingly popular for renters who are seeking additional space and other advantages, but are unable or unwilling to purchase a single-family home. On the “bright” side, Zillow Chief Economist Dr. Svenja Gudell says suburban apartment complexes will experience a major upgrade to meet the needs of urban renters who are migrating to the outskirts of the city. “Because walkable urban centers close to amenities are typically a big draw for renters, you’d expect rents to rise faster in the city than in the suburbs — which is exactly what we’ve been seeing until very recently,” said Gudell. “But a handful of factors are helping turn the tables and beginning to push suburban rents up at a higher clip. “These include deteriorating rental affordability in expensive urban cores; new apartments, albeit high-end ones, opening downtown compared to relatively few in outlying areas; and preferences among some renters toward the space offered by single-family homes in the suburbs,” she added. “Rents themselves are still lower in the suburbs, but if demand keeps growing for suburban rentals and supply continues to lag, that will also start to change.